The University of Ulster and its partners are celebrating the 500-day countdown to the Olympics with a sporting extravaganza, giving away 500 free places on the University’s sport camps in 2012. Today pupils from Rosstulla School for children with special needs, Belfast High School, St Malachy’s College Belfast, students from the South Eastern Regional College and primary school’s from Lurgan, supported by the University’s School of Sports Studies students got the opportunity to meet the Olympic and Paralympic heroes and try Olympic sports at the University’s world-class sports facilities. The Ulster Sports Academy through the support of thinkTASC, one of the University’s corporate sporting partners, is giving away 500 free places on next year’s sports camps, on the same day the tickets for the Games go on sale. Dr Nigel Dobson, Co-Director of the Ulster Sports Academy, said: “The 500-day countdown is all about inspiring young people to get involved in sport by getting them to meet sporting heroes and getting them excited about the Olympics in 2012. With the support of thinkTASC, we are giving away 500 free places on our sports camps in 2012 which can open new doors to people from all sections of the community. Guests will include BT ambassador and Paralympian Nathan Stephens, GB javelin and shot put athlete, who will join Ireland’s 2008 Beijing Paralympic gold medallist Michael McKillop who holds the world record in 800m and 1,500m, at the celebration. Nathan and Michael will address local school children, students and special guests and tell them about their preparation for London 2012. Welcoming the initiative Sports Minister Nelson McCausland said: “The Stormont Executive is committed to increasing participation in sport and to supporting our sportsmen and women in achieving world class performances on a national and international stage. With the world's largest sporting event only 500 days away and taking place so close to our shores this provides a once in a lifetime opportunity to encourage our young people to take up sport and for the people of Northern Ireland to feel part of the excitement. “I commend the University of Ulster and BT in celebrating this milestone and in the run up to 2012 look forward to working with our partners to ensure Northern Ireland continues to benefit as much as it can from having the world's greatest sporting event on its doorstep." Harry Porter. Managing Director of thinkTASC , which is part of the HPA Group said: “We are delighted to be part of this very special day at the University of Ulster and as we have benefited significantly in recent years through our work with the University’s Sports Academy. We felt that we should give something back to young people in 2012, and what better way than providing 500 free places to try new sports activities during the Games at a range of excellent sports facilities across Northern Ireland. 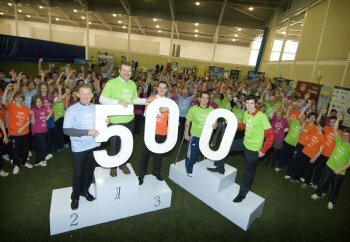 The multi-million pound sports facilities at the University’s Jordanstown campus will host the event on Tuesday 15 March, which will mark 500 days until the opening ceremony of the 2012 London Games. BT is the official communications services partner for the London 2012 Olympic and Paralympic Games. Peter Russell, Head of Public Sector, BT Northern Ireland said: “The Games are about excellence, and BT is going to give the London 2012 Games the most comprehensive, gold medal-winning communications infrastructure ever. The Ulster Sports Academy hosts sports camps at Easter and during the summer at its Magee, Coleraine and Jordanstown campuses annually giving children the opportunity to get active and enjoy the health and wellbeing aspects of sport. To be eligible for one of the 500 free places at the University sport camps in 2012 please visit www.sportsulster.com. Book for 2011 and be in the draw for 2012.